I'm still in the Lake District, hence why there has been a lack of posts, however I thought I'd do a little one about some products that I have been using this holiday! 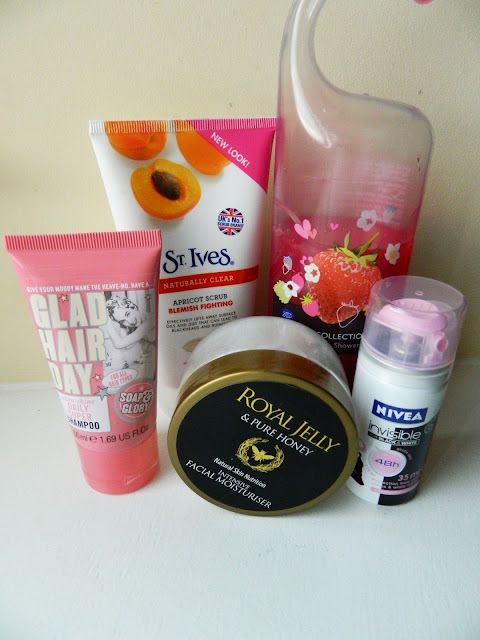 I'm a huge fan of Soap and Glory products! I absolutely adore the retro packaging, the quirky, humorous titles and the fact that they do not test on animals. I have previously reviewed the Soap and Glory foundation, which I re-purchased after finishing my first one. Glad Hair Day smells gorgeous and is perfect for my hair (which I have a lot of, but is fine as opposed to thick, and gets greasy after one day). I sometimes find that shampoos leave my hair feeling heavy, however I haven't had this problem with Glad Hair Day. It is a shampoo that you can use every day, but I personally like to alternate between two shampoos, as I find my hair looks better by doing this. This mini product is £2.50 for 50ml at Boots and is the perfect 'travel' size for taking on holiday. I bought this product a few weeks ago after the lovely Amy had reviewed it on her blog. Despite being 21 I seem to only just be getting 'teenage' skin. I have had a few bad breakouts on my chin, especially since I came off the pill and stopped having steroid injections (which were reducing a lump on my ear caused by a bad ear piercing.) I have to say that this product hasn't miraculously cured my blemishes, however I do believe it is helping. It is recommended that you us it three or four times a week. I tend to use it after my morning shower. The product itself smells fruity and lovely and is quite a nice texture, to say it's a scrub! Make sure you apply it gently, and try to ex foliate in small circles for best results! I am going to continue using this and hope it clears my skin after using it for another month or so - I'll keep you posted! This product is simply divine. I love all things strawberry (apart from actual strawberries - weird I know) so this is the perfect scented shower cream for me. Seeing as we don't have a proper shower at the house we're staying at (we have a roll top bath - lush!!! ), I have been putting it my bath water. It produces lovely creamy bubbles and leaves your skin feeling gently cleansed. however I am happy to apply it in the morning before I put my makeup on. Although it's consistency is quite thick, I don't find it heavy, and it does leave me skin feeling silky smooth. I am definitely going to purchase my own pot when I have some pennies. big lake in the heat and have remained feeling fresh and comfortable! This deodorant also states that you won't get those horrible yellow marks on white tops from wearing the deodorant often, however I'm yet to test this. It also says that it lasts 48 hours, but I'm not really sure about the accuracy of this 'claim' as I re spray the next morning after my shower / bath anyway. Nivea Black & White smells pleasant and definitely does the job - I will be re-purchasing (a bigger size)! In Superdrug you can currently buy a mini sized one (35ml) for £1.19 or buy 4 trial / travel products for the price of 3. I hope you've enjoyed this little post and maybe even found it useful, as I don't tend to do many beauty themed posts! I have a few things planned for the next posts so keep an eye out for those over the next couple of days. I love Soap & Glory products so much! I love Soap and Glory products so much. I've had my eye on this product for a while, but I hadn't heard much about it. I'll definitely be checking it out now, thanks. i really need to get my hands on the st ives scrub again, havent used it in ages but its really good!